Holy! I cannot believe that I am already at two full years of gluten free living. Does this mean that it's my gluten-anniversary? Hmm we might need to find a better term to convey that one, it just doesn't have the catchy ring that dia-versary does (re: the anniversary of ones diabetes diagnosis). Either way, time has been really flying by. I would like to thank everyone for all of their ongoing support and love. 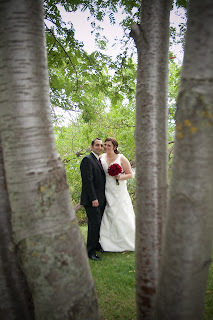 As you may recall, on September 6, 2011 Abisaac and I will be marking our two year wedding anniversary. To be honest, sometimes I wonder how he can put up with me. My silliness, my dietary needs, my ongoing frustration with said dieteary needs and everything else that goes on around us. I am a very very lucky woman to have someone so wonderful in my life who is strong enough to put up with all my nuttiness and still loves me no matter what comes our way. I am also of course very thankful that I have been so well supported by family and friends throughout my learning process of living gluten free. It sure has been a process! From cooking new and different meals at dinner-time to hosting parties and gatherings of friends who are either gluten free or have other dietary restrictions, to failed attempts at baking followed by joyful masterpieces, just to list a few. And of course, we have had our share of flops. Abisaac and I were out recently and I chose to eat something that I knew was a higher risk for contamination. I knew there was a possibility of cross contamination and I still went forward and ate it anyways. I know it's a cop-out, but I am not even going to share wtih you all what this particular item of food was, partially because I am embarrassed and partially because I just don't want to (sorry everyone). The point of the story is that I paid for this decision and my stomach was not at all happy with me and the stomach pains lasted long into the night and following morning. To add insult to injury, we then of course got stuck in heavy duty slow moving construction on the Whitemud in Edmonton. Let's just say that healthy feeling Amanda wouldn't have been nearly as frustrated and upset with the road construction as cross contaminated Amanda was. While we were stuck in non-moving construction traffic I recall clearly telling Abisaac two very important things. Firstly, I said "next time I say let's have (that food) please please yell at me and say NO WAY!" Secondly, I said something about how I cannot believe that I used to experience that same type of pain and stomach disruption each and every time I ate anything. Holy, I cannot believe I endured that kind of pain and stomach upset after eating virtually anything and I somehow just put up with it. I would be willing to bet that there are many many others out there who have stories just like this one of poor choices leading to terrible painful outcomes. I know I won't! I have spoken with numerous people who are now Celiac and yet they put up with this kind of horrible and seemingly unmanagable stomach pain and upset after eating almost any food. My question to you is, would you do it again? Do you do it again knowing that you'll pay for this choice in a very negative way? We’ve found a new and wonderful restaurant. 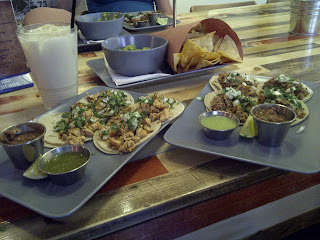 It’s called Tres Carnales Taqueria. It’s a “fast casual” truly Mexican restaurant located at 10119 100A Street (Rice Howard Way) in Edmonton. The atmosphere in Tres Carnales Taqueria is lively, fun and hip and bouncing with energy. The staff truly loves what they’re doing, you can just tell by speaking with them. This is their passion, it’s obvious. The menu, while seemingly on the smaller side, is almost entirely gluten free. Not just gluten free but naturally gluten free which makes it even better! Turns out that the only thing on the menu that is not gluten free is the beef taco, but one of the Carnales (Daniel) explained to us that they are working on finding a recipe to make this item gluten free, but just haven’t had enough time yet. It is on their radar and that’s what matters to me. “It started with 3 friends (or carnales in Mexican slang) who all collectively became inspired by the miracle of the authentic Mexican taco. Warm soft corn tortillas adorned with slow braised local meats and the freshest produce. They reminisced about the many days they had spent eating these delicious concoctions on a side street or near a beach, somewhere in Pacific Mexico. These same 3 guys happened to eat, sleep and breathe their passion for the restaurant experience. The collision was inevitable. Tres Carnales Taqueria serves different tacos (chicken, beef, pork, vegetable), home made guacamole &amp;amp; taco chips and we’re not talking about the from the bag kind at all. These are homemade and so delicious. You won’t find sodas and other common restaurant drinks at Tres Carnales Taqueria either. Instead you’ll enjoy Mexican beer (not gluten free), Sangria and the most delicious drink called Agua De Horchata a rice based drink that tastes just like rice pudding. 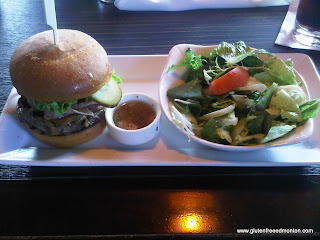 A couple of weeks ago I had my first gluten free burger at Milestones. I haven’t been to Milestones for years, mostly because I didn’t think they had much to eat that was gluten-free except for salads, but now they have a small gluten free menu with just a few items. Now that I am reading the description again, I don’t remember being asked what toppings I wanted on my burger, but I do remember how it tasted – it was really good. The burger patty was thick and juicy and cooked perfectly, the gluten-free bun was soft and toasted lightly and the lettuce, tomato, onion and pickle made it perfect. I looked inside the bun to see if there were any condiments and I couldn’t see any, but I didn’t care because the burger was so juicy and even though the bread was toasted it wasn’t dry at all. It was the best burger I can ever remember having in my life (even when I could eat gluten)! The salad however, left something to be desired. It was basically spring mix (you know the mix you can get at the grocery store), with a tasteless dressing and nothing else. I took one bite and left it. But don’t let that discourage you, the burger is excellent and quite filling on its own so you won’t even miss the salad – I didn’t. Even before my gluten free days I always enjoyed a good piece of pizza, who doesn't? However when I learned of my celiac diagnosis I admit I thought pizza would no longer be a food that I could enjoy. Since that day we have come to try a variety of different gluten free pizza crusts and mixes and while there are definitely benefits to each, my all time favorite (at home) is the pizza crust mix by Chebe. It's unfortunate that we cannot readily buy this mix everywhere and we have to either order it online from the USA and have it shipped via multiple wonderful friends who live in the USA and have family in Edmonton. OR my mom has to pick it up when she is visiting family in Winnipeg. Thankfully we have options at our disposal that probably not everyone has. The point of this blog post is not to boast about my love of Chebe products and my frustration about them not being readily available in Canada (darn dual language requirement laws). The point of my post was to share a new favorite pizza topping combination that I had never tried before and now think will be top of my list when seeking something creamy and loaded with flavor. Of course I cannot take the credit for creating such a masterpiece, I wish I could. I was looking for a use for chicken and ricotta cheese and I did not want to make a lasagne, which is what I often use ricotta cheese for. Instead I found this recipe on http://www.allrecipes.com/ and honestly all I typed in the search field was "chicken and ricotta" and wow was I impressed. Melt 1 tablespoon butter in a skillet over medium heat. Cook the chicken in the butter until no longer pink and the juices run clear, 7 to 10 minutes; remove from heat and set aside. Combine the ricotta cheese, 1 tablespoon butter, garlic powder, oregano, salt, and pepper in a microwave-safe bowl. Heat in microwave for 1 minute; stir to combine. Spread the mixture over the pizza crust. Scatter the mozzarella cheese evenly over the pizza. Arrange the cooked chicken, broccoli, and mushrooms evenly on top of the pizza. Bake in the preheated oven until the cheese is melted, about 20 minutes. * I did not remember to use the canned mushrooms, but I don't think we missed out on anything. I also barbequed the chicken with a brushing of pesto sauce on it before cutting into cubes. And I used the Chebe brand gluten free pizza crust mix. What are your favorite pizza topping combinations? This year was the first year in a long long time that I was able to go to the Taste of Edmonton festival. In years past there have been menus put forth prior to the festival outlining the Celiac Friendly food items throughout the festival. 2011 Taste of Edmonton Festival went one step further for those of us with dietary restrictions. This year they put on each list of restaurants given to festival goers, the legend "V= vegertarian N= nuts C=Celiac Approved" and this to me was a fantastic option. As well this year the festival organizers went even one step further; in front of each restaurant booth at the Taste of Edmonton, on the sign showing which foods they were showcasing, they also included the legend for those with dietary restrictions. Alberta Beef Petit Tender w/ Blue Cheese Potatoes: Zinc restaurant - Just as I always do and just as we always recommend people do, I asked the woman dishing out this item about what is in the sauce they were putting on top of the beef. To my disappointment, she told me that she was not certain if it was truly gluten free friendly and therefore she did not feel I should eat it. When I asked her "why then would it be listed as celiac approved?" she had no answer for me. She told me that they cannot be certain because different people have been making the sauce throughout the festival. Then she went to serve me the beef, with no sauce, but with crispy onion strings on top (obviously not gluten free!) I quickly said no to the onion straws. I must say, this was my first attemp at the foods at the festival and it was very disappointing to me. Papusas: El Rancho Spanish restaurant - This was an item I had eaten before and loved so I was very comfortable knowing that it was in fact gluten free friendly. However, while waiting for my papusa, I asked the man serving the foods what they use to coat their Mexican fried Ice cream (also being served at the festival) and when he told me "corn flakes" I sadly walked away thinking; I'm not going to be eating that as I am certain those corn flakes are not going to be gluten free. I later went home and looked at our previous post about this restaurant and found that this dessert is not listed at celiac friendly on their menu. Pad Thai: Numchok Wilai restaurant- In my opinon there are certain commonly found foods in various restaurants that for me, tell me whether or not I would like the restaurant and and of their other menu items. Pad Thai is one of those foods. To me, if a restaurant can make a great Pad Thai then I am convinced that other menu items will be successful as well. This particular Pad Thai was fabulous. It wasn't spicy, it was a huge portion and I can say that becuase of it, I would like to try this restaurant out in the future. Beef Lemongrass Skewer: Hoang Long Family restaurant- I recall going to this restaurant with friends in my pre-gluten free days and loving it. This booth was by far the most popular booth with the largest continuous line up at the entire festival. It seemed like everyone was walking around with a beef lemongrass skewer or multiples. I loved this booth. Butter Chicken w/ Rice: Khazana restaurant- We used to live downtown and we often would pass this restaurant and yet we had never tried it before. I was quite impressed with their Butter Chicken. Similarly to the Pad Thai I described, Butter Chicken is a food item that I personally base my view of a restaurant on. This Butter Chicken dish was full of flavor and had a little kick to it, just the way I like it. 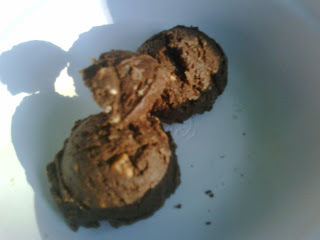 Chocolate Peanut Butter Chunk: Tra Amica Cafe and Bar- WOW! This dessert was heavenly. I love love loved it. After being told that foods were not truly celiac approved I was leary, so just as I had in other booths I asked the woman serving what was in the Chocolate Peanut Butter Chunk. To my pure delight she told me that this item "contains chocolate, peanut butter and cream" ahhhhhh that was music to my ears. I love chocolate an peanut butter together. It's gotta be an all time favourite of mine. It was the best food item in the entire festival as far as I was concerned. There were many more food items available to try, but by this point we were full and satisfied and I was over the moon excited with my dessert choice. We did not eat any more, guess we'll have to be sure to try again next summer. The moral of this story is that you should always be extra careful and remember to ask questions even if it's not convenient for those waiting behind you, because your health and safety are top priority and errors do occur. I would however like to know, who it was that was responsible for determining if the food items being served were "Celiac Approved"? I think it might have been up to the individual restaurants, and that to me is not the best plan when serving food to large crowds of people.